Alexander Oparin speculated that the atmosphere of the early Earth may have been “chemically reducing” in nature, composed primarily of methane, ammonia, water, hydrogen sulfide, carbon dioxide or monoxide, and phosphate, with molecular oxygen and ozone either rare or completely absent. In such a reducing atmosphere, electrical activity like lightning (or possibly impact shocks or ultraviolet light) could catalyze the creation of certain basic small molecules or monomers such as amino acids and other simple organic compounds. These compounds then accumulated in a “primeval soup” and could become chemically bonded to other monomers to form more complex organic polymers, such as the long, chain-like molecules (such as proteins and nucleic acids) which are essential for building living creatures. In fact, the proteins essential to life are made up of just 20 basic amino acids. In order for cells to accomplish self-replication, the cooperative action of both proteins and nucleic acids is required, and the complex information detailing the specific structure of the proteins inside living things is stored in nucleic acids like RNA and DNA. In an attempt to prove Oparin's hypothesis, the famous Miller-Urey experiments, by the young Stanley Miller and his professor Harold Urey at the University of Chicago in 1953, demonstrated the feasibility of producing basic organic monomers such as amino acids in conditions which attempted to simulate the conditions believed to have prevailed on the primeval Earth. 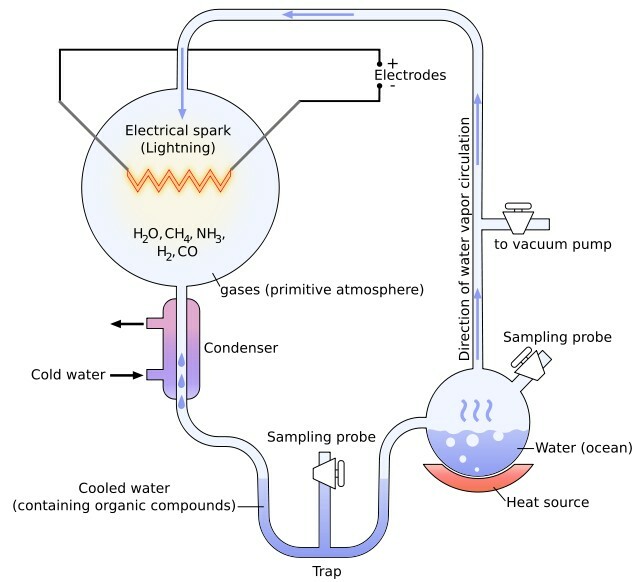 The experiments involved the simulation of an atmosphere consisting of a highly reduced mixture of gases (methane, ammonia and hydrogen), the presence of pools of liquid water and sporadic sources of energy (with electricity simulating lightning storms). Miller's simple but audacious experiments produced, over a very short time period, five of the amino acids used in living cells. One of his less publicized experiments, using gases found in volcanic explosions (also a common feature of the early Earth), has recently been uncovered and re-analyzed and has been shown to have produced over 25 amino acids. Encouraging though these early experiments may perhaps appear, critics have pointed out that the Miller-Urey experiments were far from conclusive, especially as they also resulted in several other substances that might well cross-react with the amino acids (and potentially terminate the peptide chain). More recent research, based on the composition of the atmospheres of Venus and Mars as well as analysis of very old Earth rocks, has even questioned the whole basis of Miller's reducing methane-based early atmosphere, arguing that a carbon dioxide rich early atmosphere is more likely, which would make the creation of life-building ingredients much less likely. Neither did Miller's work explain how the relatively simple organic building blocks went on to polymerize and form more complex structures, interacting in consistent ways to form a protocell. However, in 1961, John Oró showed that the nucleic acid purine base, adenine (a chemical component of DNA and RNA), could be formed by heating aqueous ammonium cyanide solutions under conditions which may have been similar to those of primitive Earth. In the 1950s and 1960s, the American biochemist Sidney Fox demonstrated that amino acids could spontaneously form small peptide structures under conditions that might plausibly have existed early in Earth's history, and that these amino acids and small peptides could also be encouraged to form closed spherical membranes called "microspheres", which are similar to primitive cells. Other more recent research by Jack Szostak has shown how simple hydrocarbon fatty acids can spontaneously form into tiny bubbles, sufficient to protect and compartmentalize developing genetic material, like early cell membranes. He has also demonstrated how these membranes may grow and even spontaneously self-replicate. Most scientists now agree that RNA was the crux molecule for primitive life, effectively guiding life through its nascent stages, and only beginning to take a backseat when DNA and proteins (which perform their jobs much more efficiently than RNA) developed. RNA is a complex self-replicating nucleic acid molecule, similar to DNA, made of repeating units of thousands of smaller molecules called nucleotides that link together in very specific, patterned ways. This “RNA world” hypothesis, however, does not explain how RNA itself first arose, only how it helped more complex life develop later. Scientists like John Sutherland at the University of Manchester, though, undeterred by years of failure in this field and using imaginative ways of recreating early Earth conditions, have recently succeeded in synthesizing two of the four essential building blocks of RNA molecules from simple chemicals that would have existed on Earth four billion years ago, and are already working on the others. They have even worked out ways in which these parts could spontaneously combine to form something similar to RNA, although the odds of this complicated process arising extemporaneously must be considered vanishingly small. Some commentators have argued that the spontaneous development of life runs counter to the Second Law of Thermodynamics, which rules that entropy and disorder inexorably increases over time and that order and organization always declines. The work of the Russian-born Belgian chemist Ilya Prigogine in the 1960s and 1970s, however, showed that many systems spontaneously organize themselves if they are forced away from thermodynamic equilibrium (such as by radiation or other unknown influences). Besides, the law specifically applies to isolated systems, whereas living systems are necessarily open and interactive systems. There are many other examples of apparent spontaneous increases in order (such as the growth of crystals from featureless liquids, the development of large-scale structures in the universe, etc), but the growth of order in one place is always at the price of entropy generated elsewhere (such as the production of heat or other types of radiation).